Bert Halliday, Senior Chemical, Chipman, Inc. PROBLEM: Chipman, Inc., of Stoney Creek, Ontario, is a Canadian manufacturer of flowable agricultural formulations. In the manufacture of these formulations, they receive a variety of solid active ingredients (technical) from several suppliers. This technical is dispersed in water to form an approximately 50% by weight soilds concentrate. To assure thorough dispersion, it is critical that the solid technical material be ground to a very fine particle size, 3-5 microns average. One problem encountered with this grinding is the heat-sensitive nature of some of the technical materials used. 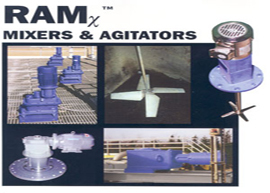 Care must be taken or the technical will agglomerate, and Chipman uses a wet grinding process to avoid heat build-up. The method they had been using consisted of pre-sizing via a colloid mill and then fine grinding with an attrition mill. Chipman had been considering changing the pre-grinding step with the idea of increasing their processing efficiency and improving productivity. 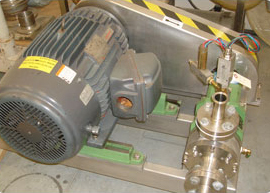 In addition, wear and tear on the colloid mill created a high maintenance cost that Chipman sought to avoid. 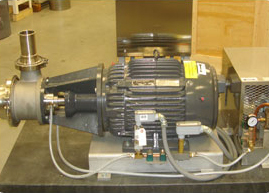 Replacing the rotor and stator on the colloid mill costs about $6,000. With some of the more abrasive technical active ingredients, replacement costs could add up to a considerable figure. SOLUTION: After reviewing the literature on a reversible homogenizing mixer, Chipman decided to see if the mixer could do a better job than the colloid mill at pre-sizing the technical. 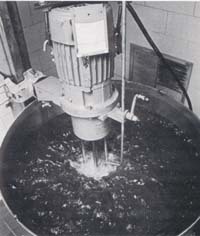 A laboratory size homogenizing mixer was brought in and tested, and Chipman concluded that what took two hours to process with the colloid mill could be done in about one hour with the homogenizing mixer. According to these laboratory tests, the homogenizing mixer could cut processing times in half, and, based on these results. Chipman decided to install the homogenizing mixer in the presizing step. In this step, the ingredients are blended with water in approximately 900 U.S. gallon batches. During charging, the reversible mixer is kept in a downward, vortex mode which draws the technical down and into the water. After all the technical material has been added, the mixer is switched into the upward mode causing an umbrella flow pattern which disperses the particles, and the mixer can be cycled back and forth to accomodate size reduction. 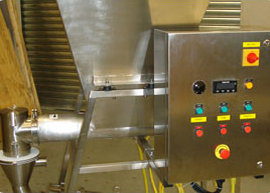 Twelve models of mixers are available to handle batches up to 10,000 gallons. In addition to the 5 bladed rotor, the mixer has only one other moving part. An adjustable baffle plate keeps the operation relatively neat and clean. While putting the material through the homogenizer, air does not appear to become entrained in the resultant emulsion. Later on in the process, entrainment does not occur requiring that defoaming agents be added to the product. Following pre-grinding, the material is transferred via a pumping mechanism to an attrition mill holding tank from which the material circulates through an attrition mill repeatedly until the desired size reduction has been accomplished. 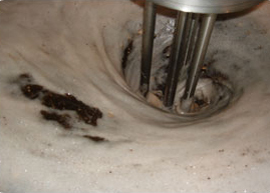 In the attrition mill operation, the material flows at a high speed from the holding tank through a confined bed of agitated small grinding media. 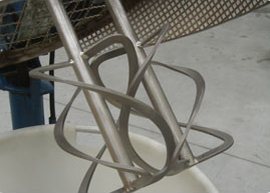 Several passes are made until the particle size specifications of the product are met. RESULTS: In general, Chipman has found that the homogenizing mixer has cut the process time for the pre-grinding step by 30%. Along the improved productivity, replacement costs for worn rotors and stators in the reversible mixer are about 10 times cheaper than replacing the equivalent parts in the colloid mill. In addition, since the homogenizing mixer can be moved from storage into production fairly easily, it has been able to provide the kind of production Chipman needs. 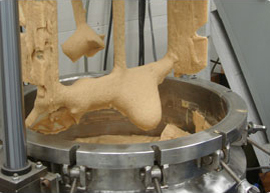 Chipman manufacturers a wide variety of flowable formulations, and, when the mixer is not being used, it can be stored out of the way where it will not take up space on the shop floor or in a mixing vessel.